Aquaplus has published the first official trailer for Utawarerumono Zan, the first action spinoff game in the Utawarerumono series, while also announcing a September 27 release date in Japan. This game's genre is described as a Combo Action game, and as you can see in the trailer, it plays like a hack-and-slash action game that can be seen in Dynasty Warriors, Sengoku Basara, or Fate/Extella games. 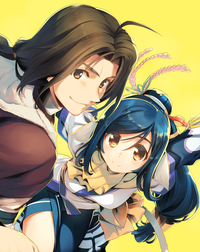 It has also been announced that Utawarerumono Zan will be developed by Tamsoft, the company which is also known for having developed other hack-and-slash games like Senran Kagura and Gintama Rumble. Pre-orders of this game will be opened very soon in Japan. Utawarerumono Zan will also have a Premium Edition which adds the game's original soundtrack, a visual staff book, and acrylic character plate. Utawarerumono Zan will be released for PlayStation 4 in Japan on September 27. No English localization has been announced for this game yet.